My name is Greg London (aka “Sweets”). I love to play trumpet and listen to Jazz. I figured I would create this site to share the licks and patterns I and others have learned over the years. I also wanted to share my favorite Jazz trumpet videos and Jazz trumpet solos. Feel free to contact us if you would like to contribute licks and patterns to the site. Visit the Contributor page if you would like to be added to the list. Also let me know if you are aware of any good Jazz trumpet videos or Jazz trumpet solo sound bytes you would like to share. Comments on posts are always welcome at Jazz Trumpet Licks. Make sure to include your favorite website with your comments and a picture by adding a Gravatar. One more thing, Jazz Trumpet Licks is a continuously growing site. We are adding new Jazz licks and Jazz trumpet videos as much as we have time for to make it more educational. Feel free to subscribe in a reader or through e-mail to get notified of new Jazz licks and Jazz videos that are added to the site. Also join the newsletter to get even more cool Jazz stuff like Jazz Theory lessons, Jazz tips, even more cool Jazz Videos, and so much more. I’m currently stationed with Navy Band Northeast. I was stationed in New Orleans beforehand and miss the area. I was also fortunate enough to have been part of the Louis Armstrong Quintet (MM Jazz) program at the University of New Orleans. I’m just about higher tenured out of the Navy and am planning to start a Doctoral program (DA Jazz) at the University of Northern Colorado this Fall. I wish you the best of luck and feel free to keep in touch! We will definitely keep in touch Matt. Great site, the licks are fun to practice and you sound great. I hand the Navy Band Northwest at Stevens Jazz Night this week and thought you would be in the band, but found out you transfered to New Orleans. I got to play with the band again and had a great time. Good luck and keep up with the great licks. Glad you like the licks Ed. Greg your site is tremendous. You are really doing a great service for the jazz community. I am referring my students to it at every lesson. thanks a lot i apologyse for my basic question . That’s a good question. I would use a metronome all the time when you’re practicing. It gets kind of annoying, but will help with your sense of tempo issue. My best answer to this question would be to do a lot of listening, I really do mean a lot of listening. 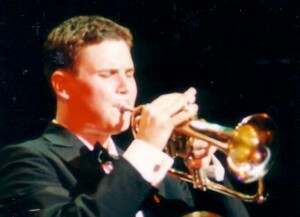 The more you listen to other recordings of trumpet players soloing or any other instrument taking a ride, the more you will develop their style and then eventually get a style of your own. If you are having trouble with time in general, I would suggest to always practice with a metronome. Hey Joe, I hope the Jazz licks are helping. This site is the shiz man! Thank you for donating your time to the creationg and maintenance of such a great educational site! You the man! Thanks ZFunk…. I like that word “shiz”. I’m going to start using it in the future. Are you still a member of Navy Band New Orleans? I was stationed there a few years back. I did 8+ years in the Navy Music program and now working on a Doctoral Degreee (DA Jazz) at the University of Northern Colorado. I also fly once a month to participate with the ANG Band of teh Southwest (LA, CA). Thanks! Yeah, I’m still in Navy Band New Orleans. That’s cool that you used to be in the Navy Band. I like your site, it looks cool and some great music too. I’m Alexander, the trumpeter from the Moscow Philarmonic Orchestra and a founder of the Russian trumpeters’ site Trumpet Club (articles, notes, forum etc.) Let’s make links exchange between our sites? The best way to link to this site is to post your website at the Jazz Trumpet Licks Forum. I’m sure there are lots of people that would be interested in your site. We can go ahead and link up, just show me where this site’s link is at TrumpetClub.ru and I’ll add yours to this site. Hey Scott, glad you like the site. I’m taking JazzTrumpetLicks.com to a new level. There will be more Jazz licks to come in the future. Dude. I’m so down with this site,I can’t even tell you. I’m new to my horn and jazz really but I’m in it with both feet! Thanks! Hey Brian, glad you like the site. Just found this site. AWESOME!!! Thanks for all the videos…keep it up man! How are you? Thank you very much for your work! I just found your site and I will work on your licks ! Nice job. Tell me, could you send me your licks in a pdf or word format so that I can print them on a paper sheet and work on them out of home? Would it be easy to do that? I also like to read your licks explainations.!!! Hey, glad you like the site. You can easily print the licks from this site. I think that’s the best way to do it. Hi Sweets! you are a great trumpet player, man!! Awesome work with the blog and I know you’re helping many people with it. Thanks for that comment. It means a lot man. what notation program do you use to share licks? Thanks Mike, I’ve been using Musette for the notation software. What notation program do you recommend to share licks? Musette, look it up on a Google search. It is free musical notation software for real basic stuff. It’s a great site … I am looking forward to stealing ehhh I mean learning these licks and perhaps creating some on my own. Thanks Dave, steal the Jazz licks and make them your own. That’s what Jazz is all about! Please notify me of new licks etc. Love your web site. Just wondering what gear you use. Horns and mouthpieces. Thanks for the web site. Great work! I play a Yamaha LA model and a Yamaha mouthpiece. Hey Eric, nope, not yet.. Talk to you soon.